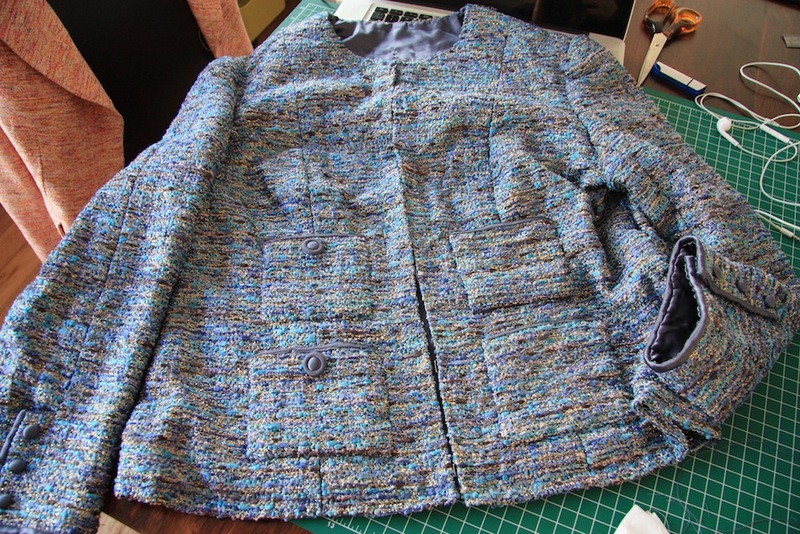 My dear mum celebrated her 60th in May, and to commemorate, I dedicated many loving hours to make her a French Jacket of her own. It’s been a long journey – I bought the fabric at B&J‘s back in late 2013, worked on her muslin over several trips interstate to visit/fit her, then worried about actually being able to finish it in time for her birthday due to our renovation works… which turned out to be a very real concern. I didn’t finish it in time for May, but instead was given a new deadline of the 28th of August, prior to their departure for a holiday in Canada, America and an Alaskan cruise. Once renovations dropped pace and I’d sewn myself a palate cleanser, I got stuck right into this. And once again – I loved every minute of it! Fitting was a particular fascination – probably because I very much inherited my mum’s body shape. Seeing the similarities between our fitting adjustments and seeing how my body will probably need to be fitted one day was really cool. One of the most interesting things about watching Susan Khalje fit the other sewists in the French Jacket class I took was how a more mature body differs from what I’m presently accustomed too. This is in no way a slight on anyone older than myself, but I find that the non-symmetrical form a body eases into as one grows older to be an exciting challenge to fit. Or maybe it’s just because it’s different to what I fit when I sew (myself) that recognising things like a ‘sunken chest’, or a raised shoulder, or a ribcage that is smaller on one side of the back compared to the other is almost a way of validating knowledge I don’t usually get to test. Either way, my mum’s jacket was a joy to fit and sew. It felt a lot quicker to sew this time around. I also think her’s is more beautifully constructed because I’m far more confident in my abilities now than I was when I made mine. I was terrified of sewing in the sleeves (firstly because Susan drapes and pins them in position for you, and secondly because I didn’t have Mum around to test it on), but I was so pleased when she did try it on how well it fitted and how nicely it looked! (By this stage I’d already ventured into creep territory and tried it on myself several times…)You really can tell the difference between a garment made specifically for your body shape and one that isn’t – even when the fitting changes are slight (like me, Mum fits the Vogue Size 14 really well). 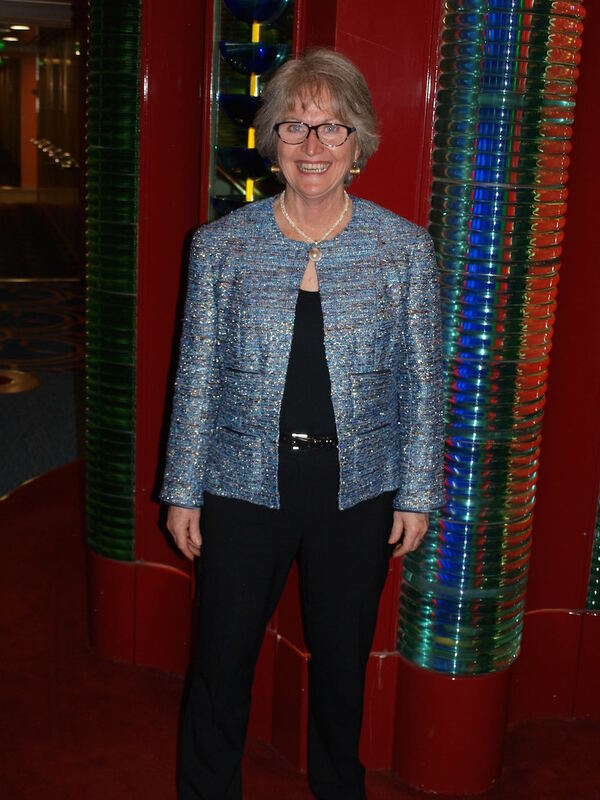 I think this was a real point of difference for my mum (I’m lucky – I’m used to it!) – she was an equally impressed at just how beautifully it fit as I was. 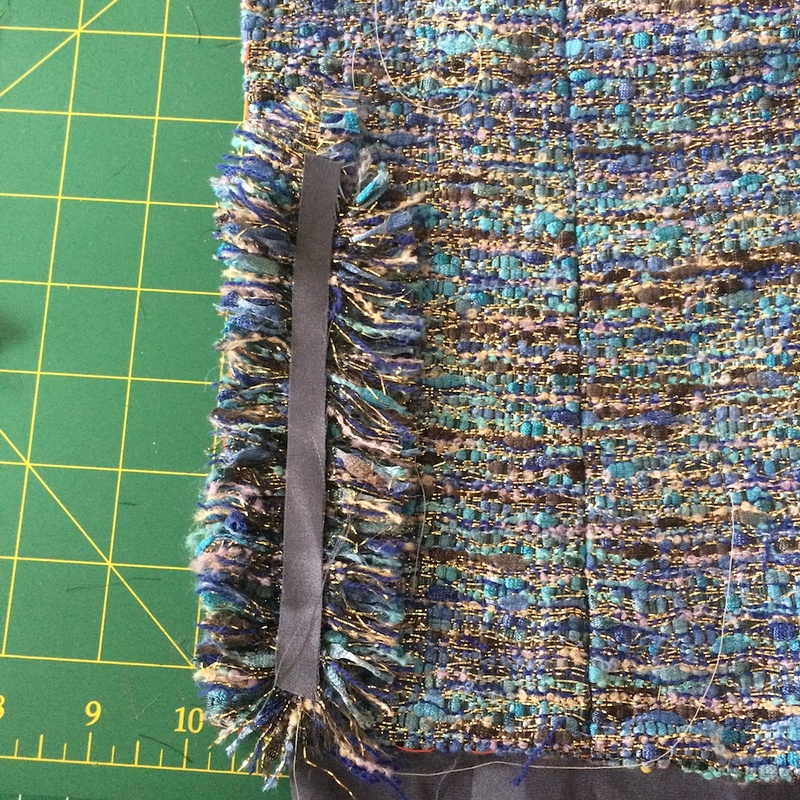 Kicking myself for not picking out a trim for this fabric when I bought it and was still in the States, I attempted to make a swatch of ‘fringed’ trim (thanks to this great resource from Cloning Couture). Mum decided that she preferred it without – “the fabric is fabulous enough” she said. I was happy with that because the time it would take to make 5 yards of the stuff would have been quite substantial! Instead, she agreed to my suggestion of a very slight bias trim in the lining fabric at the top of the pockets and around the sleeve cuff, which I thought looked rather elegant. After setting in the sleeves, I had to take up the cuffs as they somehow ended up being too long! Whilst I had left a 2inch gap between the intended cuff length and the quilting, this ended up being substantially smaller than originally planned for. Buttons were another thing I was mad at myself for not purchasing whilst I had the chance. 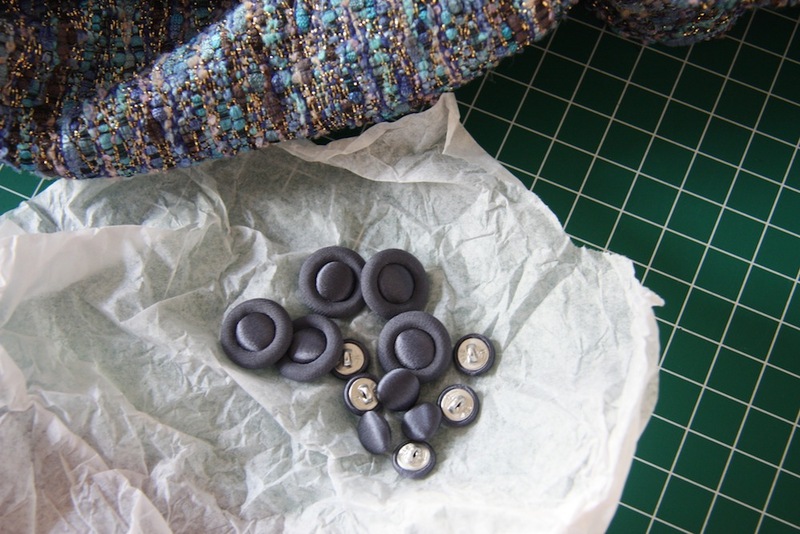 I ended up ordering some self-fabric buttons from Buttonmania. As the ‘trim’ was an understated and subtle hint of lining fabric, I went that route for the buttons, utilising both the matt and satin side of the charmuese for contrast. It seemed an elegantly matching solution, and Mum agreed. 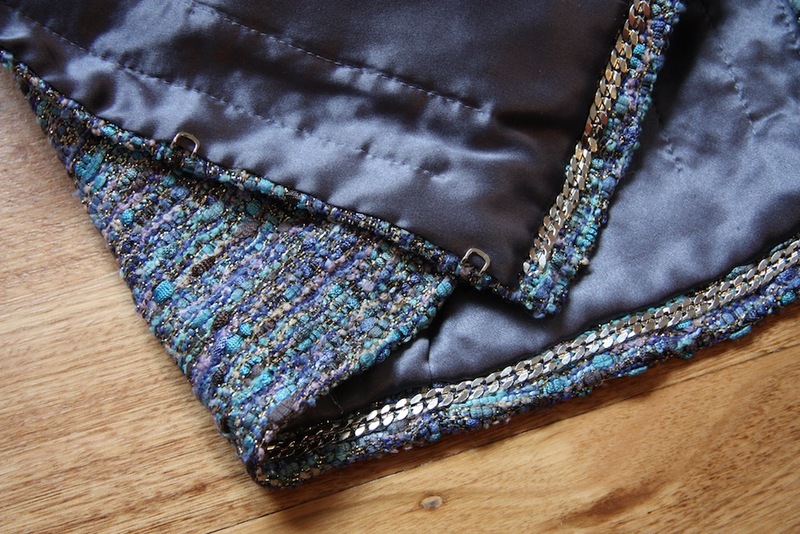 I ordered hooks and eyes and chain from Susan’s website, and after a final fitting with Mum in early July to determine pocket size and location, I finished the jacket and sent it off – it arrived about 3 or 4 days before my parents left on their holiday – perfect timing? I also sent her the remaining silk charmuese lining, as there would be enough to squeeze a sleeveless blouse from if she wanted. Give me another year, and I’ll be ready to start the third French jacket, which has already been promised to another special someone. I should probably let them know it will take at least another 2 years after that, if this project has been anything to go by! And because a garment is never as fabulous as when it’s on the intended wearer – a photo of my Mum in her belated birthday present! In the meanwhile, if you couldn’t half tell from my lack of posting on here – I have completely lost my sewing and blogging mojo. And seeing as we’ve gone straight from the depths of winter right into summer… the ‘transitional’ garments I had planned for myself as maternity wear are already obsolete! How fortuitous for me, haha :) Shame, because I have this beautiful Marfy jacket about 2 hours away from being completely finished… and it’s been like this for nearly two months now. And it will probably stay this way for many more months as water retention owns me right now! That is such a stunning jacket! And your mom is a quite a beauty. Her jacket fits perfectly and I’m sure she’s really happy with it. Your first jacket was what inspired me to make one for myself. I bought everything I need, but I never got around to it. Now you’ve re-inspired me. 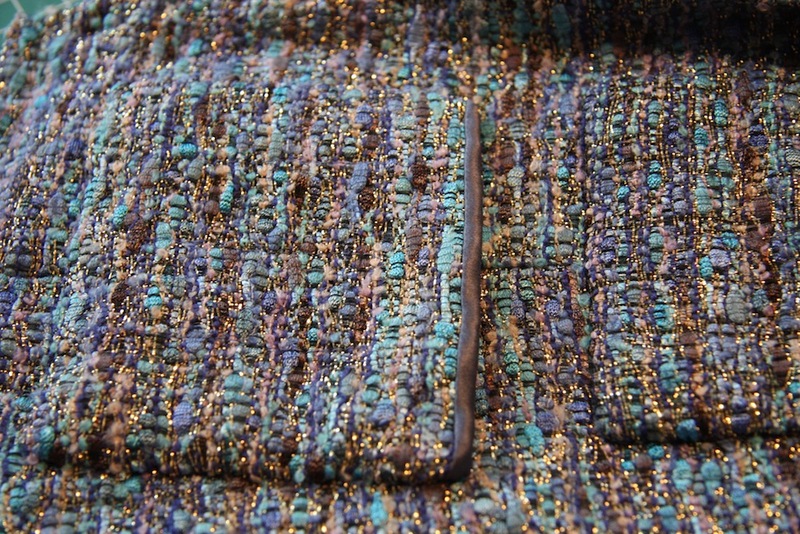 If I start now, I’ll have it for spring 2016 (which is perfect since it’s a light-weight boucle). This looks amazing! So stunning!! Just beautiful, what a lovely birthday present. Your Mum’s jacket is beautiful and so is the fit. I really like your Marfy jacket. Sewing for others has got to be the ultimate enactment of your love for another person – not something to be expected of a sewist lightly!! haha – thanks Miss Maddy, I’m sure when you do get around to it (no rush…) your mum will treasure the result. Brava! 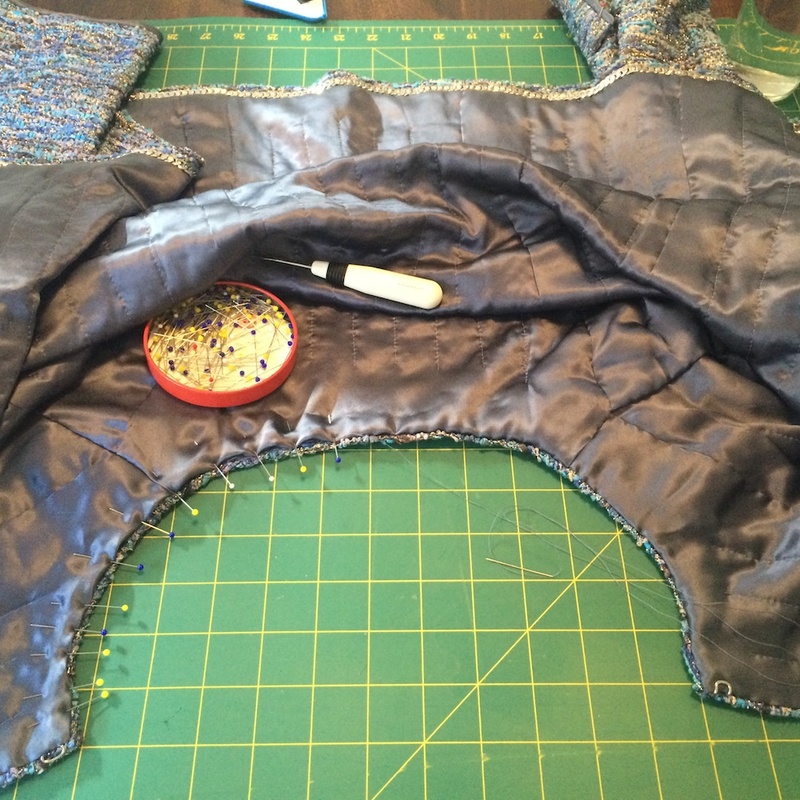 Making a French jacket for yourself is fabulous, but making a French jacket for someone who lives a distance (and is not readily available for those multiple fittings) is daunting. You have proven that patience is the key. Your Mom looks beautiful in her French jacket…you should be very proud of yourself. The lining side is so neat and precise. Yes, distance is certainly a tyranny! Knowing when I would see her next would still have me rushing at the last minute to get to a point when I could use the time with her to make some progress on this jacket!! I’m sure it was 2 years in the making well spent though. 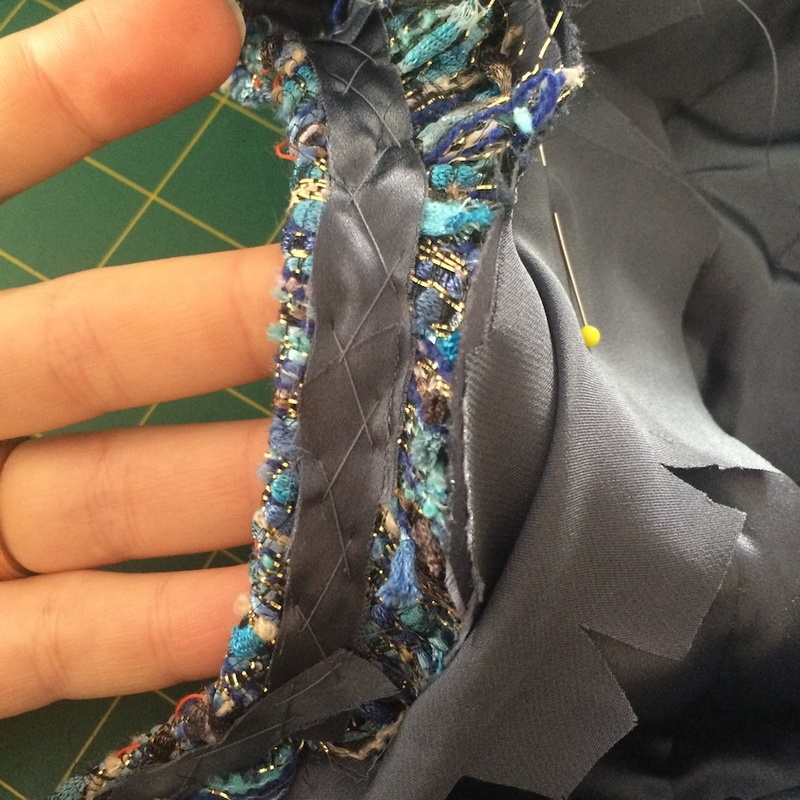 I really do love sewing this particular garment – there is just something a bit special about it. Your Mum looks very pleased with her jacket and so she should. It’s absolutely beautiful. Oh my gosh, this beautiful jacket absolutely comes to life on your Mum. She looks fabulous! Thanks Megan – I certainly think so! Absolutely stunning! Your mum’s face says it all. What a wonderful, special gift. It fits her beautifully. You are so right about these jackets “evolving during construction.” I’ve done several and the button/trim decisions don’t become clear until you see the jacket almost completed. Thank you for the reference to my blog; just another idea for custom made trim. Hope you are feeling well. It must be getting close to baby time. ‘Evolving during Construction’ – I like that turn of phrase, so apt! I was so convinced that the trim I bought for my jacket would be exactly what I wanted at the end (even though I specifically remember Susan saying it may change) that I was quite shocked at how garish it all looked together. I still would love to try a jacket with the fringe trim at some stage – probably more just for the challenge than anything else! Regardless of a little evolving, I’m fairly certain Mum was very pleased with the end result. It’s funny how I take good fit for granted now – because its so achievable for me. When someone, unused to something finetuned for their body, comes across it – it’s quite the revelation! That in itself was wonderful satisfaction for me. Your mom looks elegant in her jacket! What a special gift, one that I’m sure she will treasure forever. So stunning! Melanie I just love everything you make! It’s WORTH it to wait 2 years!! Your Mom looks so freaking fabulous! And you’re right, the fit is absolutel perfection! Wonderful Wonderful job!! 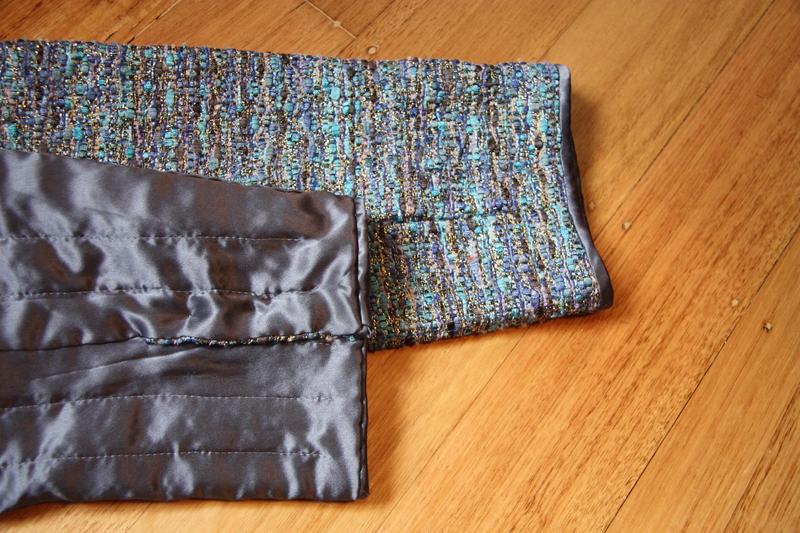 Thanks Sallie – you’re just too sweet :) It was an incredibly satisfying sew, for sure! so lovely, and what a perfect fabric choice for her, compliments her blue eyes so well. and I really like the little bias trim edge, a great touch. Fantastic! 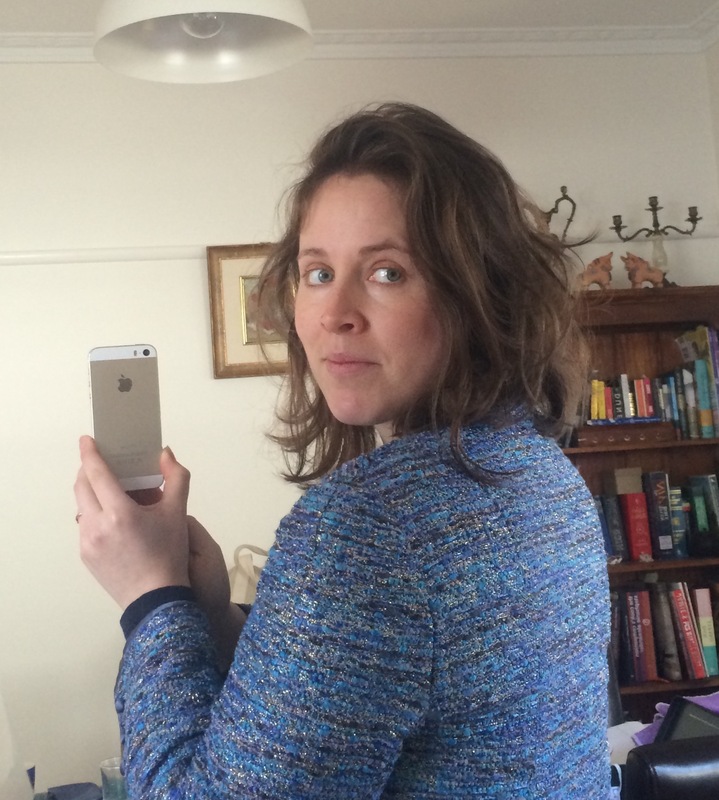 Thanks Beth – I thoroughly enjoying making this jacket. But I thoroughly enjoy making jackets, period :D Glad you like it! Your description of the process revealed the love you put into this jacket. Your mum looks amazing in it. Well done! Your mother’s jacket turned out just beautifully and looks fabulous on her. I’m loving your Marfy jacket as well. The fabric is beautiful. The jacket turned out beautifully! The fit just looks amazing. I’m sure it was worth the wait! Absolutely gorgeous. The fit is so good, and the tweed is so beautiful. Your sewing is amazing and your mum looks beautiful in her new jacket. Her smile says it all. Great work. 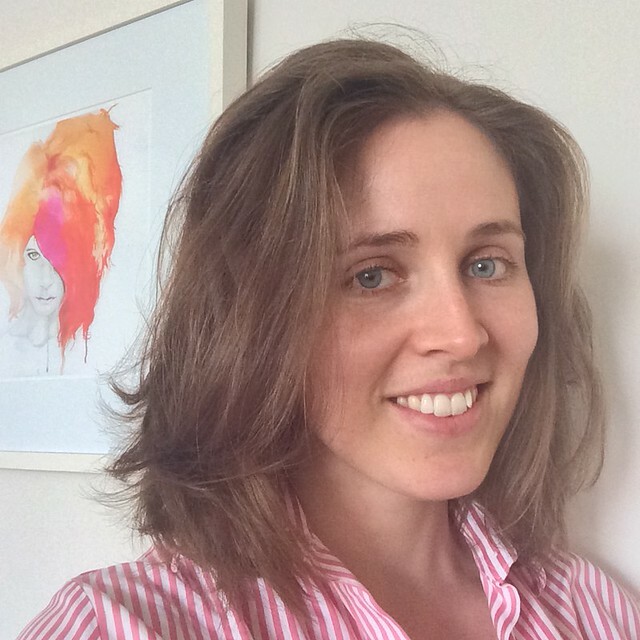 Thanks Evelyne – I did thoroughly enjoy working on this! 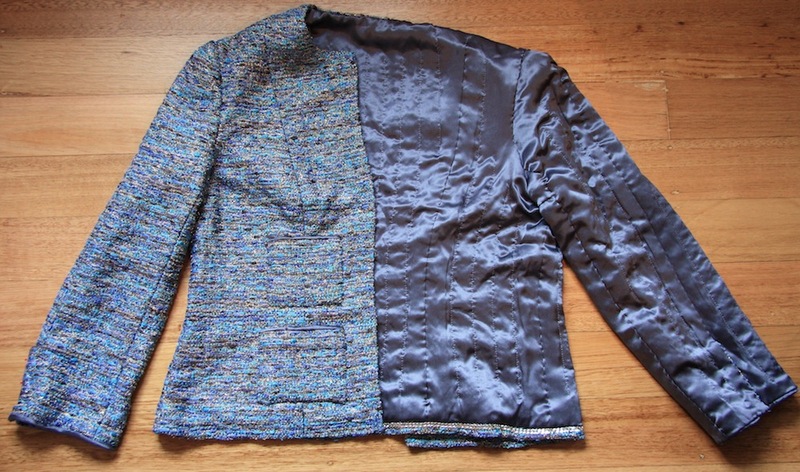 This jacket is gorgeous, and the edge detail is perfect for that fabric. I think any other trim would have detracted, so what a fabulous solution. These jackets get in your blood, don’t they? They are so intriguing in their construction and so timeless in their appeal, that it’s difficult to stop at just two! Your mom is lovely!!! Oh yes absolutely. I’d really love to know just exactly what it is about them that does that to you… there are definitely more of these jackets in my future. I think for me, the way the fabric interacts to make the sleeve head look the way it does without any external influence – just fascinating. What a gorgeous jacket. It seems like your mom is quite happy wearing it. It fits her beautifully. Great job – it looks beautiful on your mum, she is very lucky! Gorgeous! So nice of you to take the time to do that for your mother! Of anyone in my life – she certainly deserves it the most :) Thanks Rebecca! What a perfect gift – your Mum will be appreciative of the hours of work and it looks beautiful on her. And you’ve created your own heirloom!! Oh Gail I hadn’t thought of it like that – good thing it fits me so well across the shoulders!! Lucky me ;) And thank you! All your stitching looks so tidy and effortless. Beautiful! I especially like how that bias bianding looks. I too love analyzing fit within my family! My mom is nothing like me, but my sis and I are torso doubles and it’s pretty clear my dad’s mom was the blueprint. I tried on one of her blazer muslins and aside from the fact the sleeves were 4″ too short, it fit perfectly! From the looks of your ma, you’ll be looking fabulous in French jackets for years to come. How cool! Amazing how shape and form moves down through the generations. Fitting my mum was probably my favourite thing about this garment – definitely a new experience. Had I not watched Susan fit everyone in the class I did with her before having mine done by her – I wouldn’t have been able to do it. I was transfixed – watching how so many years of experience just flowed out through her hands into a perfectly fitting muslin, every time. Ha that’s hilarious! Who better than you to inherit it? 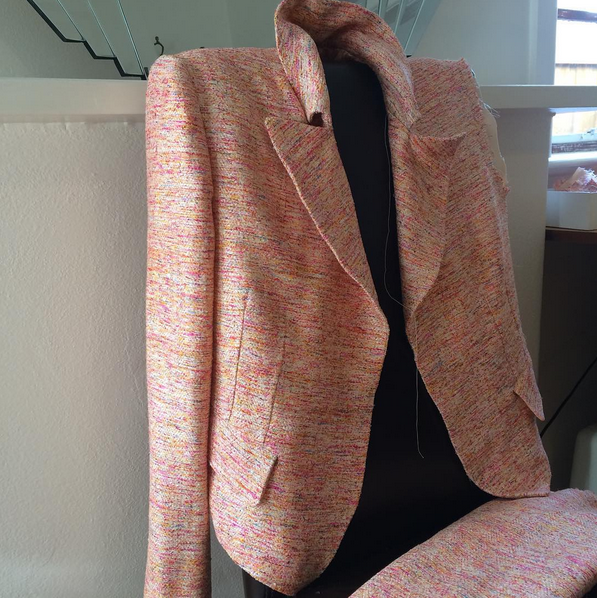 Such a beautiful jacket – the fit and the colour are just lovely! The Marfy one is just beautiful too. Your time was well spent! Your makes are always a cut above and this jacket is no exception. That you made it for you Mum just makes it even MORE gorgeous. It’s perfect. What a beautiful job! And I love your bias trim! It looks truly elegant. Thanks also for the tip on how to stabilize the neckline and front seams. In one of her videos Susan Khalje says couture sewing is a bit like engineering–a perfect fit for your talents! Side note: that Marfy jacket is still in my queue and so can’t wait to see yours!!!! 2016 is all about making blocks, fitting pants and challenging myself. Yes I really need to finish that beauty, and at least have it ready in my wardrobe for when it can be worn!!! You would look amazing in that pattern too, I know. Melanie, beautiful jacket – I would like to make one for my wife. How many hours estimated for your Mom’s jacket vs. 153 hrs for your first one? And still mostly hand sewn? Thank you John – I couldn’t say as I didn’t record the time spent on this one as I went. Possibly more because I had to fit this jacket myself, rather than have a couture expert do it for me! Still mostly hand sewn – yes. The construction was exactly the same as the one I made for myself. I can highly recommend making one – they’re addictive though! This is so beautiful! What a wonderful gift! I can’t imagine making one of these myself, but it gives me such joy to read your French jacket posts! It’s a stunning jacket and your Mom looks awesome in it! What an amazing gift! 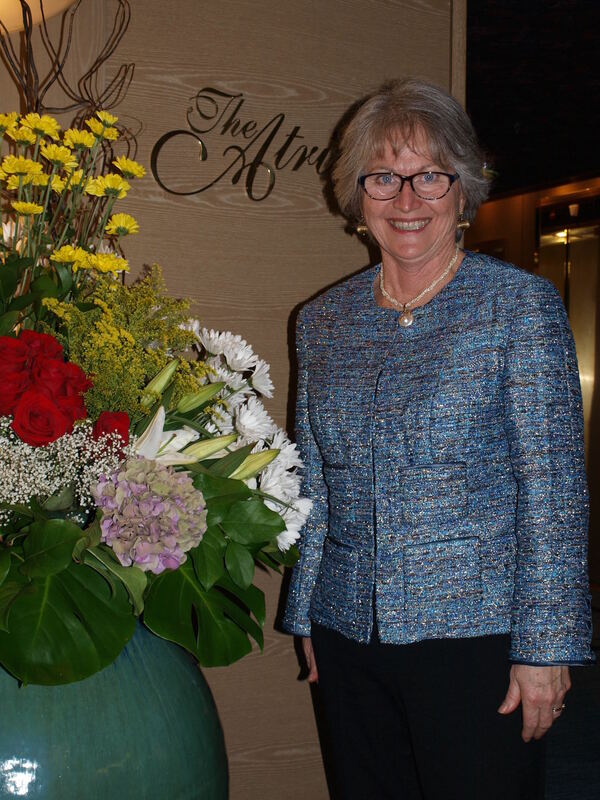 Happy Birthday to your Mum – her jacket is beautiful!!!!!!!! !